As the year draws to a close it’s time for various top 10, 20 etc lists. I am going to limit myself to 3 and share the web tools that have undoubtedly been my favourite this year. Three different tools - three different uses. Listen to various songs and complete gaps in the lyrics. I first learned about this tool at the IATEFL conference in Brighton in 2011 – interestingly, it was mentioned during one of the Pecha Kucha presentations in the evening. I found my notes from the conference about a year later and this year it has been one of my favourite tools. I hope my students enjoy it as much as I do! Besides obviously being a great tool for practising authentic listening, a lot of gaps can be filled in by predicting what comes next using the knowledge of language (grammar and vocabulary) or what is known as bottom-up processing. Also, a recent study confirms what I've always believed in - language learners who listen to songs in a foreign language and sing along make faster progress, particularly when it comes to the phrasal lexicon. Most of you will be familiar with Quizlet. It’s a website for creating online flashcards: a word (known as “term”) on one side; translation or definition on the other. 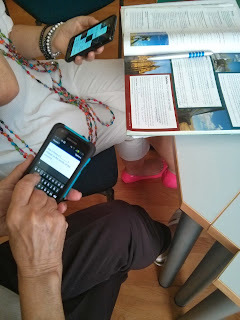 However, if approached creatively, Quizlet can be used to practise chunks of language as well. Politicians & embarrassing situations: http://quizlet.com/_da44c - In this set I don’t give definitions at all. Instead, students are given the first letter of a chunk we learned in class. When your set is ready, click on Share (1) in the top right hand corner of the page to get a short link (like the ones listed above) which you can send to your students. When your students open the link they should start with Flash cards. This is the first mode which allows them to simply browse through the list of new items. I usually ask my students to select Definition under Start with. To check if they remember the word they should click anywhere on the card to flip it over. After your students have gone through the set, they can choose one of the following review modes at the top of the screen. The modes are listed here in order of difficulty, i.e moving from mere recognition of new items (receptive knowledge) to being able to recall them (productive knowledge). The terms and definitions (or whatever you entered under these categories) are scattered on the screen and you put them back together. If matched correctly, they disappear from the screen. Perfect for matching parts of collocations. As the name suggests, it’s good for working on spelling. You type in the words as they are spoken. This mode generates a graded quiz. Questions can be open-ended, multiple choice or true/false. Possibly more suitable for teachers and for words with definitions / translations. tests students’ active knowledge of the items. They have to type in the answers themselves. Or simply Race is the most difficult game. 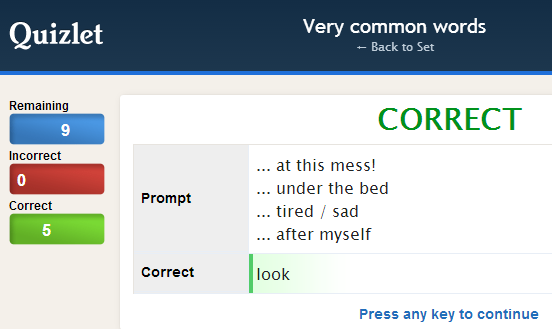 You have type in the correct answer as the definitions shoot across the screen. - You can add images to the definitions. But this isn’t all. You can also create folders and organize your sets by levels or courses. You can create classes and assign a few sets to the same class or the same set to different classes. These two options are available from the home page after you’ve logged in. Finally, if your students have smartphones – most of them do - they can install the Quizlet app. Then they have to find you (give them your username) and select one of the sets or classes you have created. For other lexical tools, check out Essential Lexical Tools on this site. Copy and paste a text and then choose one of the modes / activities: tiles, shuffle, fill in the letters or the hangman. I usually use short texts from CBBC News Round or Tiny Texts Recommendation: 18 tiles for a text of 1000 words – anything longer that gets a bit confusing. Reconstruction activities of this kind force the learner to move from semantic processing (when they mainly pay attention to the message) to syntactic processing (when attention is paid to how the message is constructed). Unfortunately, as with all good things, Textivate didn’t remain a free app for long. At the end of March this year they introduced various pay plans. A free version was still available but it didn’t allow you to save the activities and send them to your students so that they could review the text at home. As I was writing this, I realised that even the basic free plan had been discontinued. So even if you want to use Textivate in class using a projector or IWB you need to pay a subscription fee. A teacher on the in-service course I taught earlier this year recently told me that she’d got so hooked on this tool and it saves her so much time in class that 10 pounds per year is really worth it. So perhaps, considering there are not so many language-focused tools on the web I’ll fork out 10 pounds next year so that it stays my favourite app in 2014 too. Are you familiar with any of the above tools? What tools have been your favourite this year? Looking forward to your responses in the comments below. I have to admit that I am not familiar with any of these - and I use quite a few Chrome extensions. Are these for personal or educational use? Thank You so much for your useful recommendations. Thank you for your comment, David ! I certainly agree with numbers one and two! I'm a heavy user of Quizlet for all sorts of things: high frequency vocab, useful expressions, dialogues, etc. I've also been using a variety of online apps for text analysis, but Lextutor is best known and most comprehensive. I see myself recommending rewordify.com and newsinlevels.com to my students for graded online reading but I guess that's for next year. I'll look for you on Quizlet, Tom - I'd like to see you how you use it for dialogues, if you don't mind. Feel free to use my sets too. Re newsinlevels it looked good when I first saw it but upon closer inspection I realised how seriously flawed Level 1 is. Unfortunately it is often simplified to the point of absurdity. My 3rd for 2013 is Sweetsearch (www.sweetsearch.com). Yes, probably Level 1 isn't very useful. Level 2 with the audio and exercises seems alright but I haven't used it enough to be really sure. For my sts, eg., I teach workplace English with common exchanges for small talk, requests, refusing, complaining, etc. (Join class: http://quizlet.com/join/FnvVBN8T2). It's mostly phrases with some question-response exchanges. Few days ago I came across a site that is very like as lyricstraining, but it's not only focused on music, but also you can listen to some movie scenes as well: The site is http://lvlapp.com. The other site that helps me a lot is http://engvid.com, but I assume that everyone knows that site. I am familiar with engvid.com (not a big fan of it though) but thanks for suggesting it anyway for the sake of other readers of this blog. Quizlet is great! I'd like to recommend the Lex Flashcard Game app which uses quizlet sets in a fun boggle/mahjong/crossword-style game. No other apps feature this kind of game plus pedagogical tracking/review, important for actually learning from games.